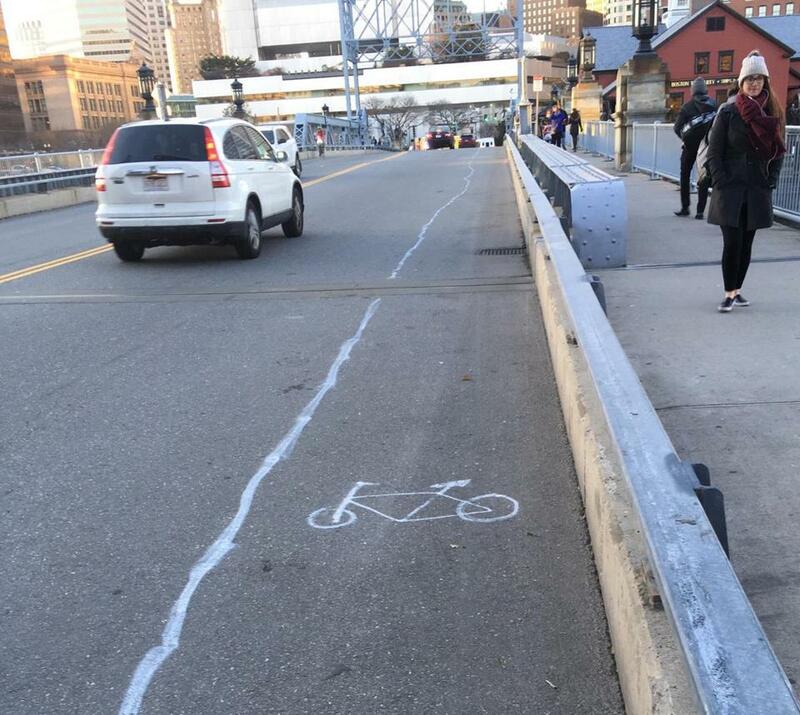 Someone took matters into their own hands and drew a bike lane on the Congress Street Bridge. Sometimes you have to take matters into your own unartistic hands. It seems someone who wanted a bike lane running across the Congress Street bridge, which connects the Fort Point neighborhood to the Financial District, couldn’t be bothered with asking for the city’s help. So they did it of their own accord. Cyclist Mike Blackwell, who rides over the bridge during his daily commute, noticed the drawing this week — a long, squiggly line separating cars from people on bikes. The unidentified person or people behind it also drew a bicycle on the street, making clear their intentions to cordon off the section of road. Blackwell said he had nothing to do with the impromptu bike lane, but was entertained by the thought of someone quickly trying to create it using a can of spray paint without getting caught. He also liked the crude drawing of the bike. The reactions to his tweet have been mostly positive, with others equally amused by the person’s efforts. “People are tweeting it from all over the world, it’s really kind of funny,” he said. Because he wasn’t in town Monday, Blackwell said he’s not sure when it first showed up. He said people have been using it, however, since it’s a major bike route. It was still there as of Wednesday afternoon. But a spokeswoman for the city’s Transportation Department said the unapproved lane would be removed. Ganiatsos said the department has been “working diligently to build safe, smart, connected bike infrastructure” throughout the city, and many new lanes are currently under construction or in the design phase. This isn’t the first time cyclists have turned to guerrilla tactics to improve the city’s streets for two-wheel travelers. In May, under cover of darkness, several cyclists placed large cartoon cutouts displaying advice about bicycle safety along portions of Massachusetts Avenue, sending a visual message to drivers and city officials that more needs to be done to make roads safe. The city later removed them. Blackwell said while he had nothing to do with the drawing, he wouldn’t mind seeing a lane painted on the bridge over the channel.